Has ice cream melted off your new high-fat, low-carb diet? Because if you’re ditching sugar and ignoring your cravings, there’s probably a small sundae-shaped devil on your shoulder urging you to cheat with a giant bowl of ice cream. So instead of finding yourself covered in sticky regret, these 20 keto ice cream recipes will help you safely satisfy your cravings so you don’t ruin your ketosis goals. I’m a big fan of taking the scenic, homemade route when it comes to keto desserts because I like to control the ingredients and macros myself. Good news: keto ice cream is surprisingly easy to whip up using staples you probably already have on hand. If your first job wasn’t at an ice cream parlor, you’ll want to start off with basic no-churn recipes and build up your sundae skills from there, just like the order of this list does. This no-churn keto ice cream recipe is team vanilla all the way. And it only calls for three ingredients: heavy whipping cream, real vanilla extract, and monk fruit sweetener. Did you know monk fruit contains 150-200x the sweetness of cane sugar but has zero carbs or calories[*]? That’s why monk fruit is one of our fave swaps for white sugar on a ketogenic diet. Chocolate fans, this next recipe is just as tasty and rich. When a chocolate ice cream craving strikes, make this creamy no-churn low-carb recipe and do your happy dance while it chills. Using organic coconut cream, dark chocolate chips, and the sugar-free sweetener Stevia, you’ll score the same decadent texture as store-bought ice creams minus all the sugar, preservatives, and suspect ingredients. 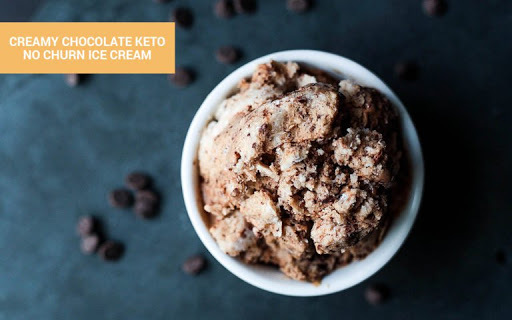 To get the best of both worlds, try this next keto ice cream recipe. Can’t decide between vanilla and chocolate? This happy medium of vanilla chocolate swirl will please everyone. Martina of Keto Diet uses a creamy, fatty base of coconut cream and real vanilla beans, and then swirls in 90% dark chocolate for a treat that only feels like you’re cheating. Don’t have ingredients like cream of tartar on hand? No problem; Martina also offers suggestions for alternative ingredients so you can use what you have at the last minute. With basic vanilla and chocolate ice cream flavors under your belt, let’s keep things simple by experimenting with another classic flavor, which also happens to be from Martina. Instead of adding dark chocolate to her low-carb vanilla ice cream recipe like in our previous recipe, Martina adds the juice of two lemons and lemon zest to her base. And that creates this crave-worthy lemon version clocking in at just 3.6g of net carbs per serving. 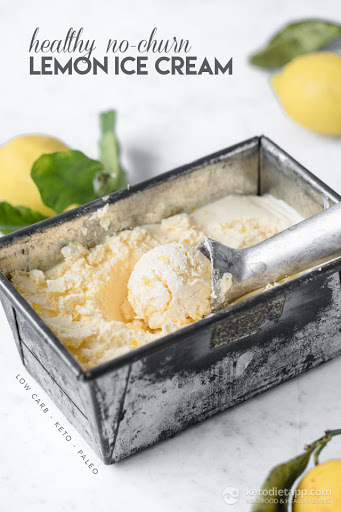 This refreshing lemon ice cream may be an unexpected favorite at your house. Surprise: You may feel that way about the secrets these next keto ice cream recipes share too. Lemons aren’t the only healthy ingredient you can sneak into low-carb keto ice cream recipes. In case you missed the “nice cream” trend in your Pinterest or Instagram feed, these concoctions are ice cream recipes that are “nicer” to your body because they use fruits like bananas and avocados as their base. While bananas aren’t keto-friendly, these next four treats show superfoods are kind of the perfect secret addition to your keto ice cream recipes. 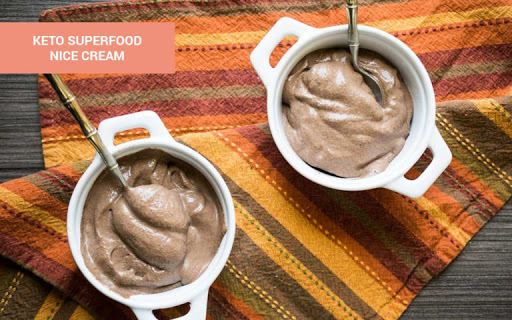 This superfood nice cream recipe uses frozen cauliflower instead of bananas so you can jump on the bandwagon without ruining your hard work reaching ketosis. Plus, picky eaters won’t even realize there’s cauliflower hiding in this recipe so it’s an ideal option for sneaking in veggies. And if you’re not ready to try cauliflower in your ice cream, the next recipe works the same way minus the veggie part. Maya over at Wholesome Yum took her “nice cream” approach a little differently by using coconut oil as her superfood and dropping any hint of veggies and dairy altogether. She also adds peanut butter and cocoa powder to create a fan favorite flavor combination. Plus, her chocolate peanut butter nice cream recipe is also sugar-free and low-carb, making it perfect on keto. It’s also vegan too thanks to the use of coconut milk and dairy-free chocolate. The next two keto ice cream recipes give away their secret superfood ingredients in their names. On top of nice cream, protein-packed ice creams have also started to flood social feeds. But depending on the ingredients used, many on the market can leave you feeling bloated and gassy. 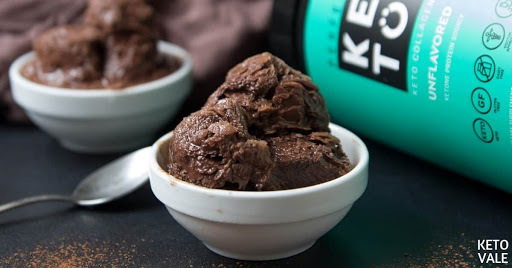 A better option is this homemade keto chocolate collagen protein ice cream from Keto Vale. Swapping out highly processed protein powder containing irritants and artificial ingredients, this recipe uses our grass-fed collagen protein which comes preloaded with MCT oil and gut-healthy acacia fiber for energy and digestive support. So while you’re on cloud nine with your low-carb ice cream, you’ll also be feeding your body a healthy dose of protein and all the nutrients that come with it. The avocado in this next recipe goes for a similar result, but instead of protein, you’ll boost your healthy fat intake. 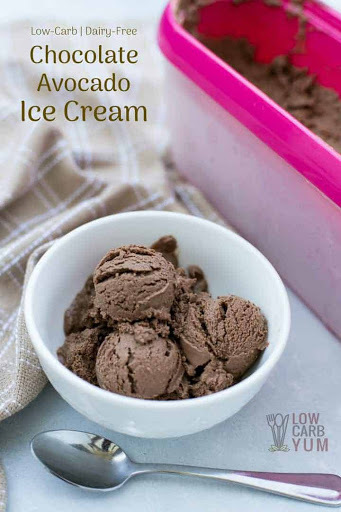 Lisa from Low Carb Yum cleverly uses avocados as her superfood ingredient for her dairy-free chocolate keto ice cream recipe. Avocados bring your bod essential vitamins and minerals like potassium, vitamin K, and folate, as well as monounsaturated fats like oleic acid to keep your heart healthy. Lisa also points out that the fiber in avocados helps ensure this ice cream doesn’t overstay its welcome in your gut, unlike store-bought versions. But as she also mentions, this recipe is more of a treat to be enjoyed every so often instead of every night, despite the healthy avocado. And for readers like me who want keto ice creams based on typically bad-for-you flavors, check out this next set of recipes. The next 10 recipes may be sugar-free and low-carb, but they’ll still remind you of those classic ice creams you’re craving. And if you’re a mint-chocolate connoisseur, you’ll appreciate this first one especially. 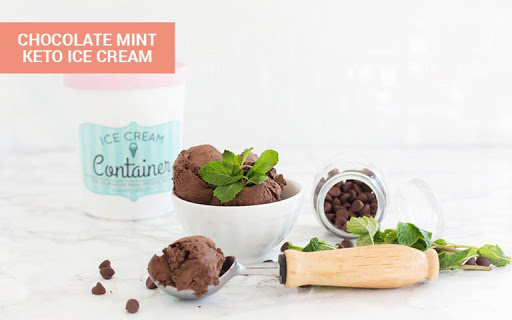 You won’t find any artificial green colors or fake flavors in this chocolate mint keto ice cream. And your taste buds will know right away that you’ve upgraded to a better version. Not feeling quite so minty? If chocolate everything is more your obsession, it will be hard for you to make any other recipes but this next one. 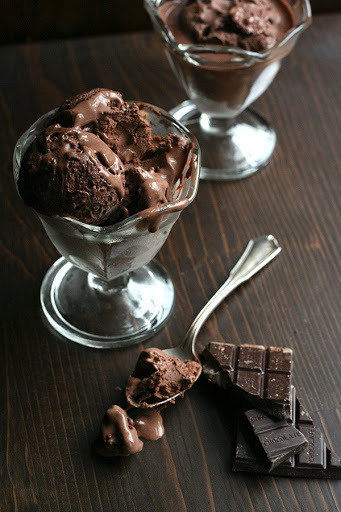 If you have an ice cream maker, this death by chocolate keto ice cream recipe from Carolyn at All Day I Dream About Food will make eight servings of creamy, dark chocolate heaven. You’ll want to share those low-carb, sugar-free servings since the macros are a bit higher than other recipes on this list. Read: Don’t make this a daily habit. You’ll also need an ice cream maker for this next recipe — and it’s definitely worth the extra effort. Think every ice cream should come standard with an ooey gooey caramel topping? Then Martina’s keto chocolate ice cream with caramel swirl has your name on it. 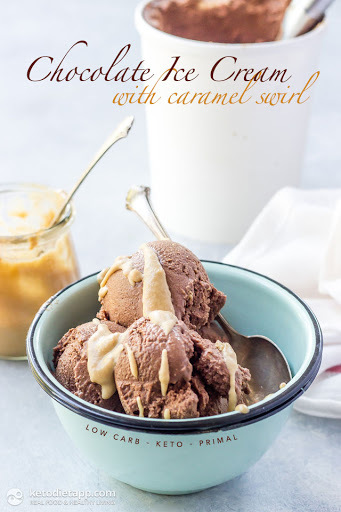 Using a homemade caramel sauce consisting of water, stevia (or monk fruit), butter, heavy cream, vanilla extract, and a pinch of salt, you’ll have a low-carb version to add in your ice cream mix and on top of your sundae. Now don’t let the ice cream maker intimidate you; all you need to do is blend everything together and pour it in. Then the machine does the rest. Since it’s so easy to use, you can also try your hand at this next recipe with your new ice cream maker. 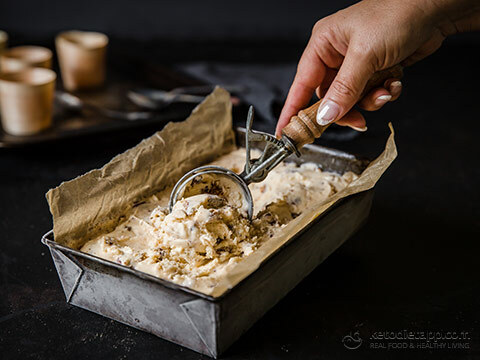 Truthfully, this ice cream recipe requires more work than others on this list because you’ll have to toast your own pecans and create your brown butter first, but it’s a small price to pay to savor this better-than-the-original keto butter pecan ice cream. Make this recipe during the weekend when you may have more time and you’ll have an irresistible treat waiting in the freezer for you during your hectic work week. If nothing tastes as yummy as hard work for a good reason, this next recipe will also make you excited. You don’t need an ice cream maker to create this sugar-free no-churn keto cookies and cream recipe, but you may need to roll up your sleeves and flex your baking skills. That’s because having these delicious cookie pieces mixed in requires you to actually bake them first. While your keto cookies are in the oven, you can create the ice cream base to maximize your time. Then just mix the two together, let it freeze, and you’ll have your very own low-carb cookies and cream ice cream worth its weight in gold. And if you’re even more ambitious, or if strawberry cheesecake is your ice cream flavor of choice, say hello to this next recipe. 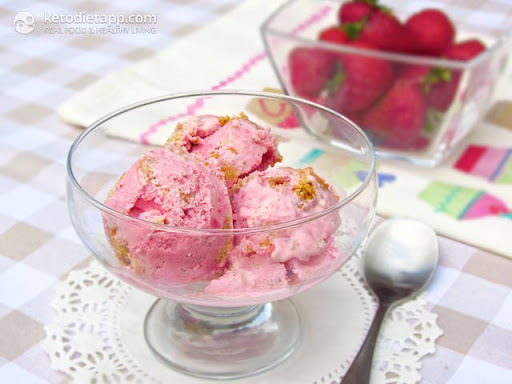 Similar to the last recipe, this low-carb strawberry cheesecake ice cream adds an extra step to your endeavor since you’ll need to first make the spot-on cheesecake crust you’ll eventually throw into the ice cream later. But if you’ve mastered the last recipe, you know you can work smarter by making your strawberry cheesecake batter as your crust cooks. By the time both are done, you’ll be ready to mix them together, let them get to know each other for about two hours in the freezer, and voila! You’ll have 10 servings of sweet, low carb, strawberry cheesecake ice cream to share or hog all to yourself. The next keto ice cream flavor is also on the sweeter side. 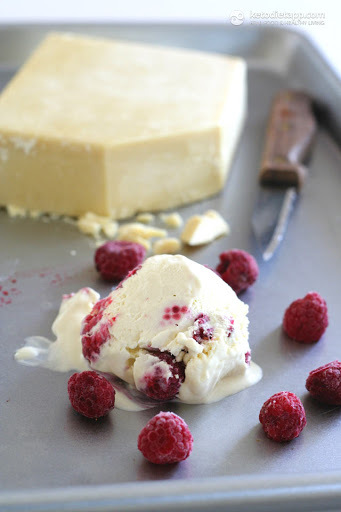 The low-carb base of this white chocolate raspberry ice cream should seem familiar by now: heavy whipping cream, almond milk, stevia (or monk fruit), and vanilla extract. The major difference here is this recipe adds frozen raspberries and cocoa butter to create a drool-worthy flavor profile quite unlike any other on this list. Die-hard raspberries fans will also want to pay special attention to this next recipe. Maya at Wholesome Yum created this simple sugar-free raspberry ice cream to help people satisfy their cravings without spending forever to do so. So this basically effortless recipe only uses three ingredients and takes less than two minutes to make from start to finish (seriously!). 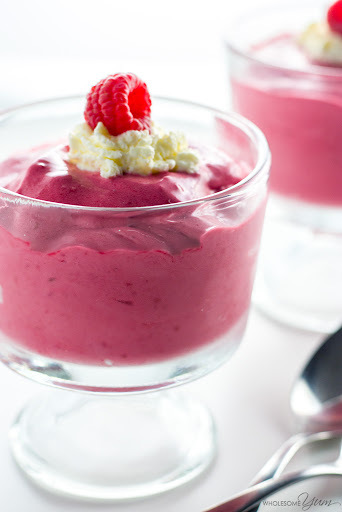 Simply add frozen raspberries, heavy cream, and your choice of sweetener to a blender and pulse together. Then you can enjoy this treat straight from the blender if you’re a fan of soft serve or sorbet, or you can pop it in the freezer or ice cream maker to create a creamier consistency. 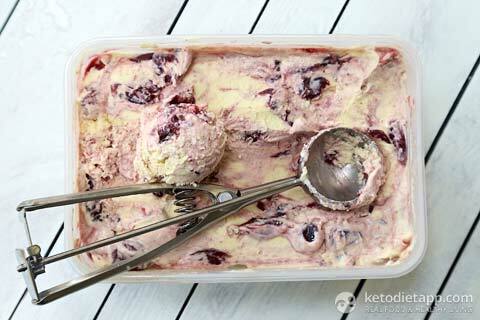 But if it’s cherries you’re craving on a ketogenic diet instead of raspberries, this next ice cream recipe is high in flavor and still low in carbs and sugar. Since cherries are usually too high in sugar to be a keto diet regular, your cravings for them may intensify as you start missing them. After all, we humans always want something more as soon as it’s off-limits. Instead of depriving yourself, this amarena cherry ice cream recipe will scratch your cherry itch without the extra side of carbs. 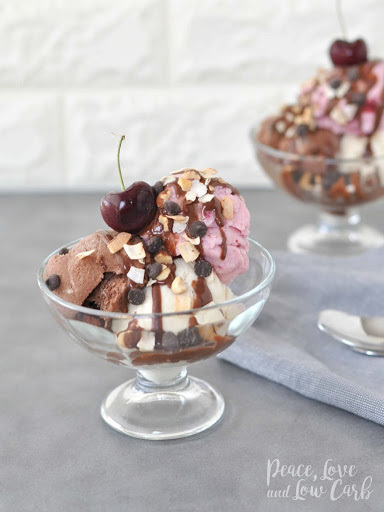 Before you jump into the ice cream maker role, you’ll need to whip up Martina’s low-carb cherry Amarenata syrup, which is what delivers the high dose of cherry flavor minus the sugar. Swirl this into your vanilla base and you’ll have a low-carb soft serve keto dessert to tickle your taste buds. You could also use your Amarenata syrup as an ice cream topping for other recipes on this list. Our next one doesn’t settle for just one berry — and it’s also anti-inflammatory. 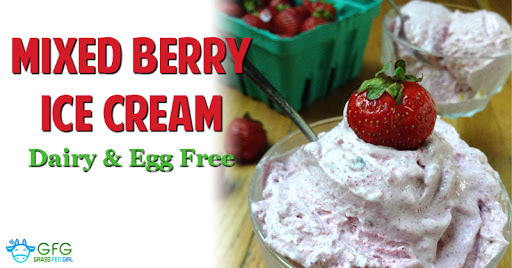 If you had your doubts about an ice cream made without eggs or dairy, Caitlin at Grass Fed Girl sets the record straight with her delightful mixed berry ice cream recipe and says you can. 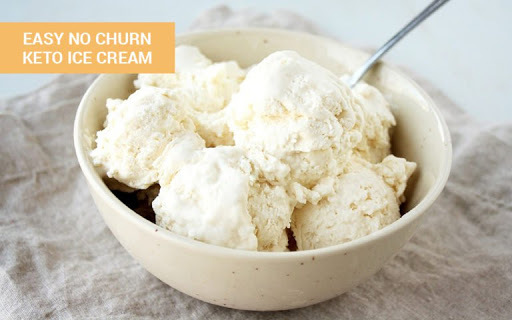 You can make this 4-serving recipe using the no-churn method or your handy ice cream machine. And to continue the surprises, did you know you can also make keto gelato all on your own too? Italian gelato differs from American ice cream because it usually contains more milk and less eggs and cream[*]. Gelato is also slow churned to limit the amount of air in the mix, which creates a denser, silkier consistency than standard ice cream[*]. Whether a date night treat or the finish to a fancy meal, these two special gelato recipes will impress all palates — keto or not. 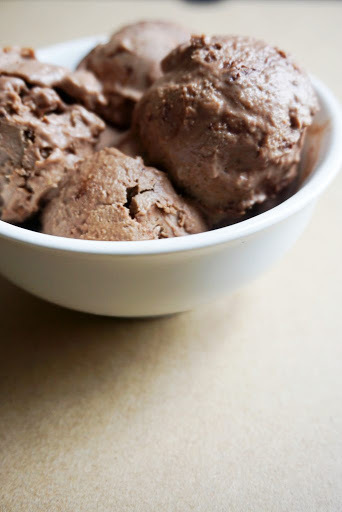 Along with Megan’s genius hacks for getting that perfect gelato consistency, you’ll need heavy cream, egg yolks, cocoa powder, peppermint and vanilla extract, and monk fruit sweetener to make this minty low-carb chocolate gelato. At just under 3g of net carbs per serving, this gelato shouldn’t kick you out of ketosis if you stick to the serving size. And if you’ve got even more carbs to spare, you could pair this gelato with a keto brownie like she does for an even louder chocolate explosion. Let’s reverse this equation and get rid of the mint with this next low-carb gelato option. 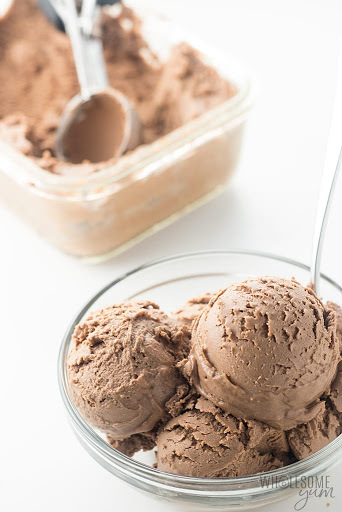 If you’re looking for a no-churn low carb chocolate gelato recipe that’s easy enough to make with your family yet still tastes as if you just walked out of a gelato shop in Italy, your wish has been granted. 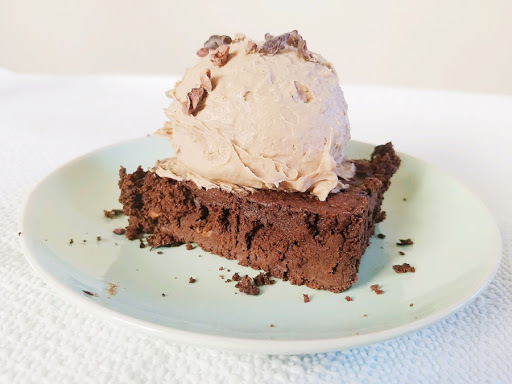 This recipe makes four servings of sugar-free chocolate gelato you can either eat on its own or use to top these rich keto peppermint brownies. You can also take your keto ice cream party up a notch by making these low-carb sugar cones! Now that we’ve discussed all these yummy keto ice cream flavors, it’s only natural to make our way over to floats and sundaes next. Remember when there was nothing better in life than a root beer float or a giant ice cream sundae? Whether you grew up spending summers at the local diner or ice cream shop, these sweet traditions don’t have to end once you begin your ketogenic diet. These classics just need a bit of keto tweaking, as this first recipe gets right on the money. The classic ice cream sundae starts with three scoops of your fave flavors, loads of fun toppings, whipped cream, and a cherry on top. Before you jump for joy, you won’t get all those components, but this low carb ice cream sundae recipe is pretty spot on for the real deal. Our final two ice cream recipes happen to be floats — and they’re also better-than-the-original takes on a classic dessert. The basics of an ice cream float are fairly straightforward: ice cream and soda. Seeing as how both those ingredients are anything but keto-friendly, it can be hard letting this vintage treat go. 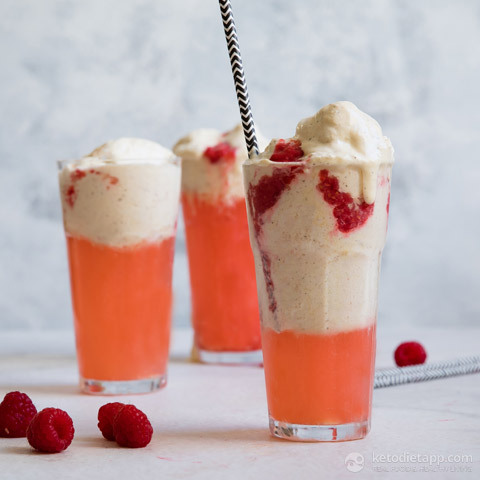 Fortunately, you don’t have to when this keto raspberry & vanilla ice cream float moseys into your low carb life. 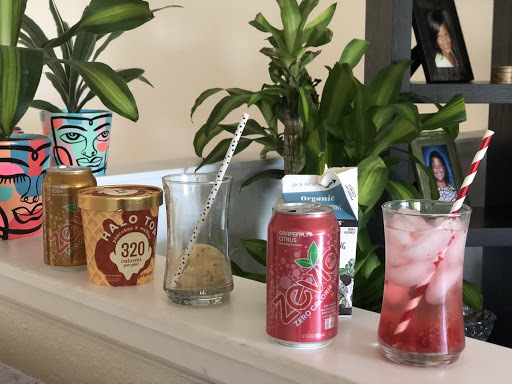 In addition to making your own keto vanilla ice cream base, this sugar-free option swaps out traditional soda for stevia- and erythritol-sweetened raspberry lemonade sparkling water for the same bubbly vibe. And if you don’t have time to make your own flavored “soda” and ice cream, this next recipe requires virtually zero time in the kitchen and gives you the option to have an almost unlimited variety of flavors on hand. Our final recipe is perfect for when you don’t have time to wait for homemade ice cream to freeze. Using a scoop of the popular low-carb ice cream Halo Top and a can of stevia-sweetened soda like Zevia, this easy float recipe comes as close to the real thing flavor-wise as you can get for such little effort. While you won’t get to control the ingredients in each of these ready-made keto staples, you will spend less time cooking and doing dishes with them on deck. And you’ll be happy to know Halo Top isn’t the only low-carb ice cream in town. I don’t know about you, but I hate wasting time at the grocery store sifting through ice cream and “frozen dairy dessert” labels to see which ones (if any) are low-carb and sugar-free. Even though certain flavors of these store-bought low-carb ice cream options may have more net carbs than others, they can be beneficial for quickly settling cravings every once in awhile — and if you stick to the serving size. Halo Top was one of the first ice cream brands to advertise how eating an entire pint of their ice cream was still better for you than eating just one serving of traditional ice cream. That’s because Halo Top averages 280–360 calories and 20g of protein per pint. Most Halo Top flavors begin with skim milk, eggs, erythritol, prebiotic fiber, and organic stevia leaf extract before their specific flavor components are added, which cuts down on calories, carbs, and sugars. But Halo Top does still contain cane sugar so you’ll need to be careful here. While many Halo flavors are low carb, some have higher net carbs than others so you’ll need to select your pint carefully using the nutrition facts and measure out your portion before you start indulging. The next up and coming low-carb ice cream is the only one specifically marketed as keto-friendly. Unlike Halo Top’s skim milk base, Rebel Creamery’s keto-aimed ice cream starts with a rich, fatty base of cream. And instead of stevia, they sweeten their ice cream with erythritol and monk fruit and never use added sugar like Halo Top. 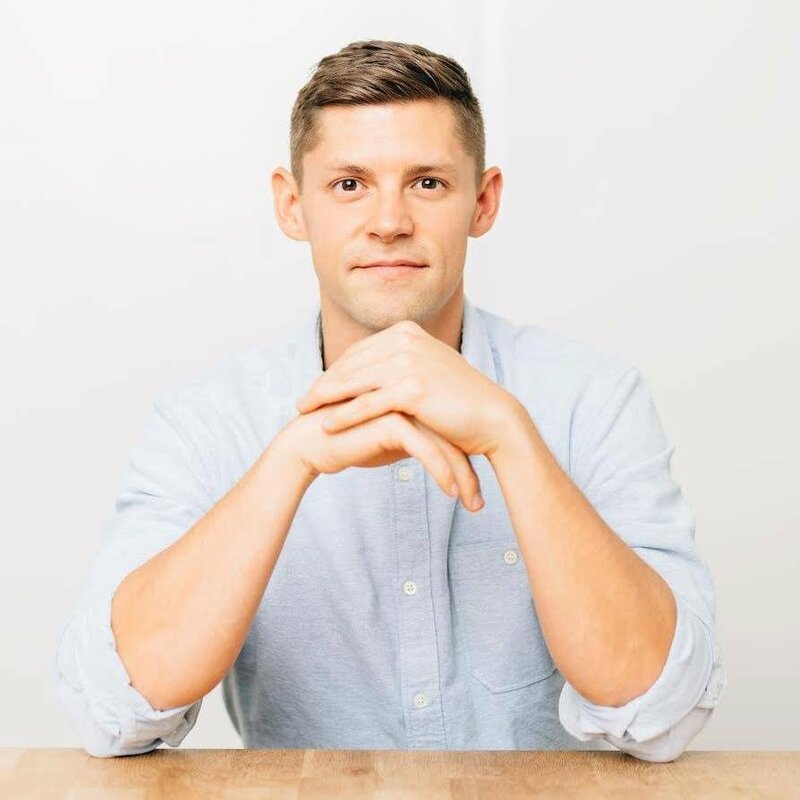 The result delivers between 56–76g of fat per pint (whereas Halo Top is 8–14g of fat) and only 5–8g of net carbs per pint[*]. No, there aren’t as many Rebel flavors as there are Halo Tops, and they’re only available at grocery stores in select US states, but they’re still one of the best options for people following a ketogenic diet. Enlightened ice cream pints are another low-sugar/low fat ice cream option boasting high protein and high fiber over high carbs. With their gigantic assortment of flavors sweetened with all-natural, zero calorie sweeteners like monk fruit and erythritol, these pints and bars won’t spike your blood sugar and will give you variety so you’re never bored. Again, IIFYM and you watch your serving size, your keto ice cream obsession shouldn’t kick you out of ketosis. If you feel deprived because you’re missing your favorite foods on keto, it’s going to be more difficult to stick with this diet and reach your body goals. So while these keto ice creams will help you satisfy your cravings with a healthier option, you don’t want to make ice cream binges a daily activity. Even if your choice is a low-carb or sugar-free ice cream, you’ll only be replacing one bad habit with another. Practice portion control and try to skip a few days between servings because if you’re noshing on them consistently, you may find yourself sabotaging your ketosis efforts and stuck at a weight loss plateau. 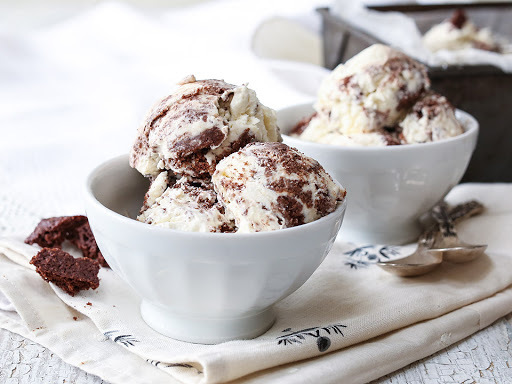 Your homework today is to pick out one keto ice cream recipe to try this week and test not only your ice cream making skills, but also your discipline. 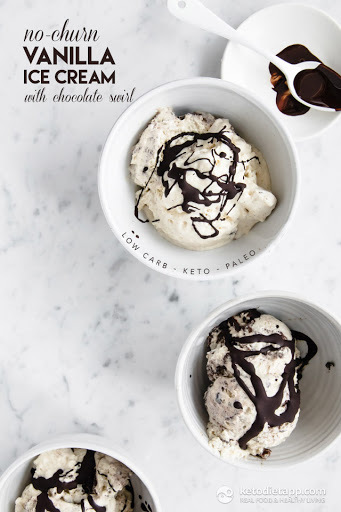 And for more keto recipes, check out these guides on low carb ice cream substitutes, easy keto fat bombs, and the best keto desserts too. Know an ice cream addict who needs help? Share this page with them! And don’t forget to bookmark and pin these recipes so you can always find them when an ice cream craving strikes.